Professor Graham ‘Gus’ Nathan & Dr Robert Dickinson, University of Adelaide. Additional peaceful participation in nuclear activities is said by proponents to be justified based on the need to address climate change. This public session will seek to explore current greenhouse gas reductions targets, emissions levels, and policy responses both locally and overseas. In addition, existing peaceful participation in nuclear activities around the world is principally the result of demand for electricity. 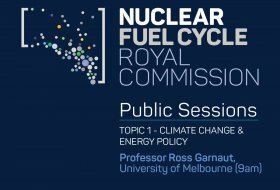 This public session will also seek to explore current and future energy demand in Australia and overseas in order to inform consideration as to whether and how energy from nuclear fuels might play a role in meeting that demand, in the context of a desire to reduce greenhouse gas emissions.